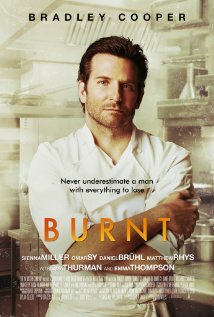 Burnt stars Bradley Cooper as Adam Jones whose a down on his luck chef trying to bring a restaurant to a three star rating. The film follows his adventures as he battles his problems to attempt to move all the obstacles put in his path. He wants to succeed. With such a restrictive format this movie struggled completely. Centring the entire plot line on Adam trying to bounce back. This is a film that appears engineered for Bradley Cooper. There is not much action and a lot of the characters were one dimensional. Other stars appear but with such a weak plot line there’s no amount of star power that can save this film. Jamie Dornan’s parts got cut – no damage to him then. But I’m wondering if Emma Thompson, Uma Thurman and Sienna Miller would’ve liked their scenes cut. It’s by far the worst film I’ve seen this year. Bradley’s character lacked depth and for movies of this sort – you have to start caring about them for it to work. Sadly, I was not taken in by any of the characters. This would be better as a Sunday afternoon movie when there’s nothing else on. I don’t know how accurate this film was in portraying the culinary world but it made me think twice. Come on Bradley you can do better. You starred with Jennifer Lawrence! Trailer reproduced from Zero Media.